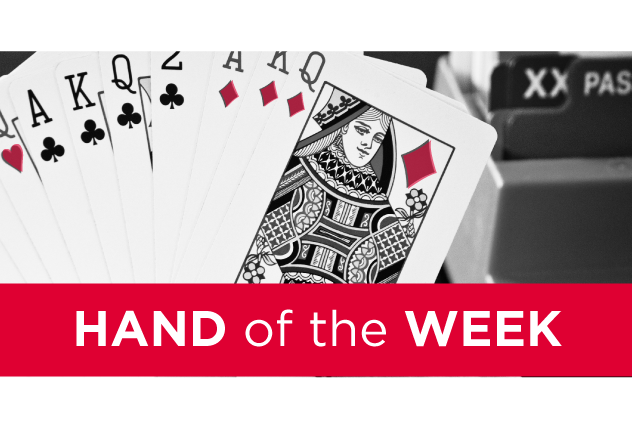 How will you take advantage after West leads the ♦A and continues with the ♦K? How will you get to nine tricks on this deal? So how will you come to 11 tricks on this deal? When you cash the ♥A, East discards. Now what? Can you prove the opponents wrong after West starts with the ♥Q? How will you get to nine tricks? What is your plan for nine tricks? How will you get to 10 tricks after West leads a trump? How should declarer proceed at trick three? What is your plan for taking 10 tricks on this deal? Put yourself in the South seat and plan the play in 4♥ after West leads the ♦7. Put yourself in South’s seat and plan the play. How will you get to 10 tricks after West leads the ♣Q?